In the pipeline industry there are many brush solutions from cleaning the interior and exterior of pipelines to weld cleaning and edge cleaning. 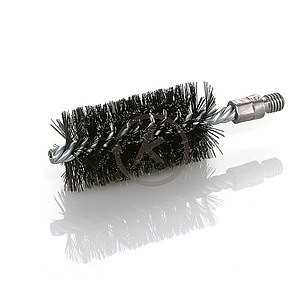 Our sealing brushes with steel profile can also be formed like the strip brushes. The dimensions range from a diameter of 40 mm to the diameter of 1000 mm and therefore cover a wide spectrum of applications. 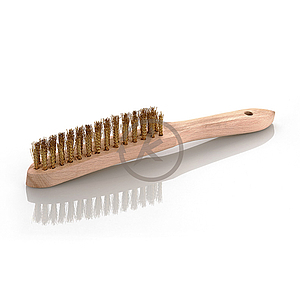 - All fill material like natural bristles and hair, plant fibres and synthetic filaments. The long period of development of this brush type has left its mark and appears in every detail of the brush. 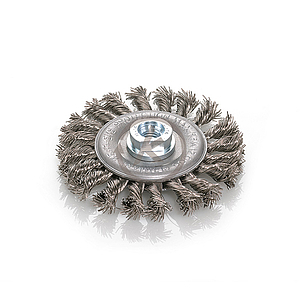 The STS-spiral coil is the only brush type that can be produced with very small diameters. Already starting at an overall diameter of 17 mm. Offering an enormous choice of dimensions and fill material qualities this brush has almost unlimited applications in light or medium work. The diagram below shows how the STS coil is constructed: the fill material is fixed with a locking wire inside the backing tape. Type 964 is made of single section brushes mounted together on a core up to the required face width. 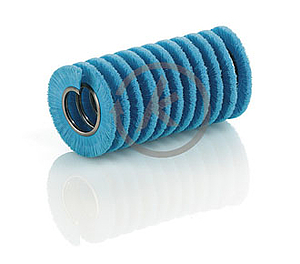 This roller brush type can be mounted on cores made from stainless steel, plastic coated steel or mild steel. Kullen-Koti recommends especially this type for heavy-duty operations with a high dense brush surface e.g. by using our single section brushes with twisted steelknots (Type Z-SH). But we can manufacture the single section in almost all other fill material types. 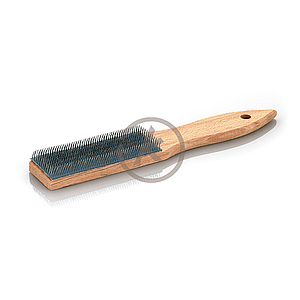 Scratch brushes with wooden cores are available in different working widths (number of rows). 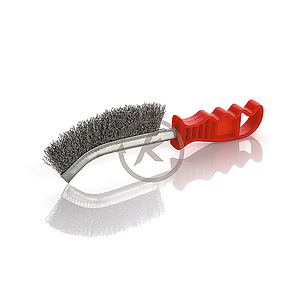 Scratch Brushes help to clean, remove rust, descale and fettle. SSHB-Scratch Brushes have a small work surface. This brush is especially ideal for working on dents in fluted surfaces. 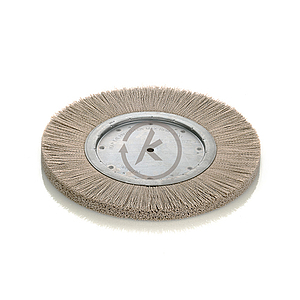 Scratch Brushes help to clean, remove rust, descale and fettle. For hand use with extension rods or power driven flexible shaft and bench machines. 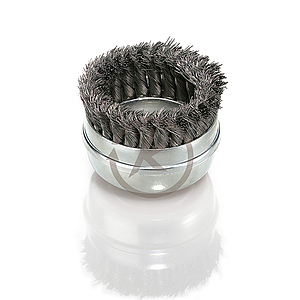 Tube cleaning brushes are suitable for drilling machines, flexible cables and machining centers. They are reliable tools used for tube cleaning and the removal of rust and scales. 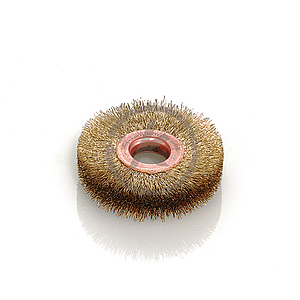 Cup brushes with or without shaft are allround brushes used in angle grinders and machining centers for removal of varnish layers, scales and corrosion; also ideal for the treatment of welds and paling-board cleaning. 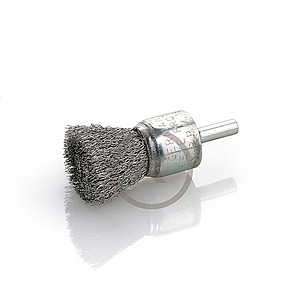 End brushes are normally used in electrical- and pneumatic tools, i. e. in the car body and motor construction and all fields of car repair and maintenance. Bevel brushes are a great mixture of cup- and circular brushes which were developed by us especially to work edges and corners in hardly accessible operation areas. The RECORD with crimped wire fill is suitable for deburring, cleaning, smoothing, polishing, dulling, paint stripping and roughing. 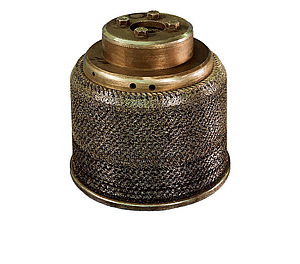 The twist-knotted ULTRA for treatment of welding seams, descaling and removal of varnish. The whole energy of the treatment on a few milimeters. 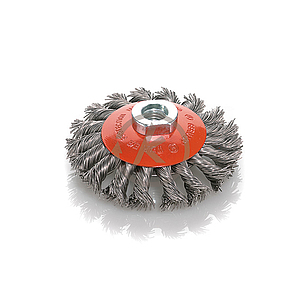 Single-section brushes from Kullen-Koti are ideal for that. Being narrow, aggressive, robust and most versatile, small work pieces can exactly be treated and profiled surfaces be cleaned, derusted and matted. 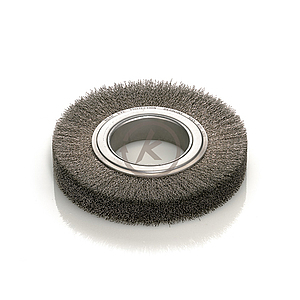 When it comes to the highest possible density fill Kullen-Koti's SH-circular brushes are unbeatable. They are most versatile due to a multitude of fill material qualities and different bore diameters make them applicable in different working widths. They are especially suitable for roughening and deburring as well as to remove rust and paint. 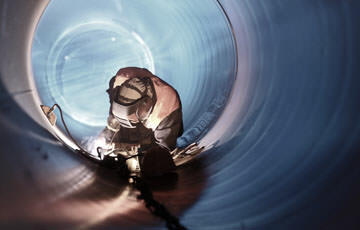 Pipeline brushes are "most wanted" for welding preparations on oil-, gas- and water pipelines in construction. 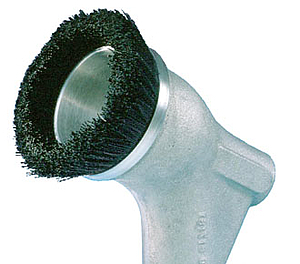 We especially produce single section pipeline brushes for operations at the fillet welds and roots of seams. If the wires are embedded in an elastic synthetic material they are extremely aggressive and durable.